Wetted Parts: SV100 Series: stainless steel, copper and seal; SV200 Series: brass, stainless steel, copper and seal. A three-way valve is normally used to control larger values; it has an inlet port, an exhaust port, and a common cylinder port. Wetted Parts: SV200: brass, stainless steel, copper and seal (SV242 acetal additional) (SV271: aluminum, acetal, stainless steel, copper, and seal) (SV281,282, FKM additional). 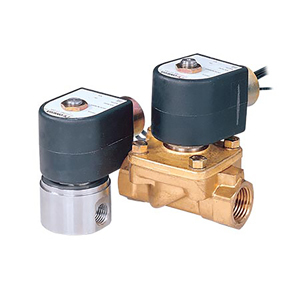 注: All SV100 and SV200 series valves are 110 Vac powered. For 220 Vac power, purchase replacement coil separately.